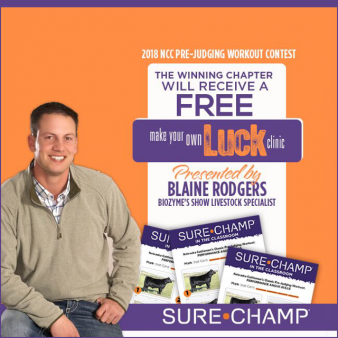 Sure Champ is proud to sponsor a pre-judging workout to help get your students ready for the 2018 Nebraska Cattleman’s Classic Judging Contest. Below you will find links to four practice classes available for download that are just like the classes you will see at The Classic. Your students can use these classes to get ready for the contest PLUS your entire chapter/club will have the opportunity to win a FREE Make Your Own Luck Show Clinic on the specie of your choice presented by Blaine Rodgers, BioZyme’s Show Livestock Specialist.To enter, just submit your chapter’s or club’s placing and reasons on the practice classes using the form below. EXTENDED! Deadline for submission is now February 9, 2018. Please Note: Only one submission per chapter will be judged for the contest. Placings and reasons will need to be typed into a document and uploaded using the form below.